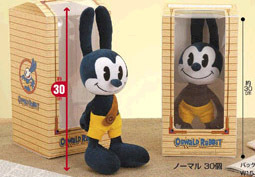 In 2004-2005, Japan went wild for a forgotten 1930s black & white Hollywood cartoon star. 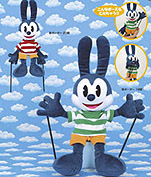 No, not Scrappy, Bimbo or Buddy... but Oswald The Lucky Rabbit! 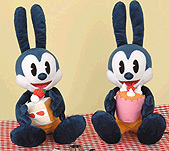 Created by Walt Disney and maintained by Walter Lantz, Oswald became Universal's answer to Bosko, Krazy Kat, Flip the Frog and Mickey Mouse. 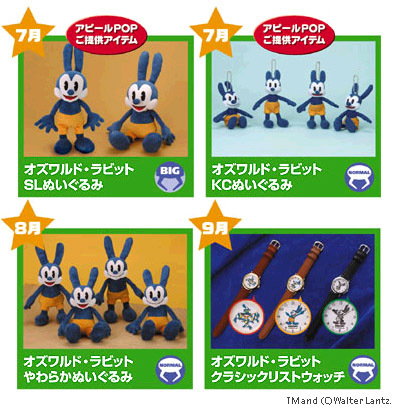 The Oswald merchandise shown (on this page) is available only inside "UFO Catcher" games, not regular retail outlets. 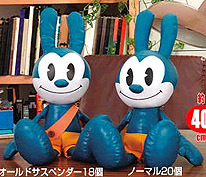 They are being made by a company called Taito as fodder for their game centers (prizes for their crane games - about $1 a try). 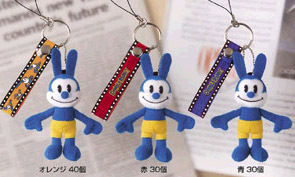 Taito is introducing new products each month. The watches were premiums for the machines last September. SPECIAL THANKS to David Gerstein and Bill Schacht. go to Toonzone's WALTER LANTZ CARTUNE ENCYCLOPEDIA.